Just pour Razzpotle over cream cheese and serve with cracker for a sensational appetizer. Finish your baked chicken by glazing with Razzpotle in the last minute or two of roasting and then dip it again at the table. After searing and baking pork tenderloin, pour Razzpotle over the top and serve. Finish your chicken wings with Razzpotle in the last minute or two of cooking and then dip again at the table. 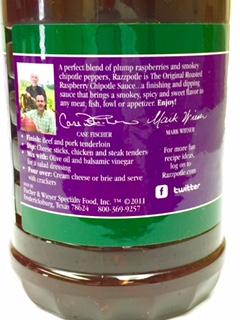 1/3 cup Fischer & Wieser The Original Roasted Raspberry Chipotle Sauce. Place cream cheese on serving dish and pour The Original Roasted Raspberry Chipotle Sauce over top, allowing it to drizzle down sides of cream cheese. Garnish with fresh raspberries and mint, if desired. Serve with gingersnap cookies or assorted crackers. Makes 2 servings. La Salsa Razzpotle hecha con frambuesas y chipotle ahumado es ideal para saborearla en cualquier platillo, por su sabor dulce y picante ?nico que desarroll? la empresa F & W.
Te recomendamos usarla arriba del queso crema para comer con galletas saladas o como dip, tambien puedes usarla en pollo, pavo, puerco o jam?n. Una vez que pruebes esta deliciosa salsa con el sabor ahumado de los chipotles y el dulce sabor de las frambuesas la vas a querer usar en todos tus platillos favoritos. Excellent - it has added flavor to my meals for many years. 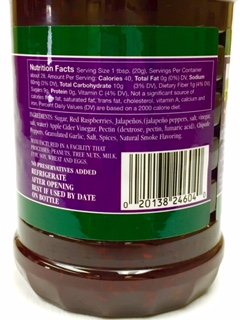 The Razzpotle sauce tastes really good, and it tastes even better when you put it on meat, cheese and crackers, bread and pretty much everything.